Rebuild your home or business in the aftermath of a flood with leading-edge waterproof floors in Otsego, MN. When a pipe ruptures in a crawl space or above your finished basement, your existing floors could be ruined by the resulting floodwaters. As versatile as laminate can be in rooms on the upper floors, it will swell up and warp when immersed in standing water for extended periods. Replace these damaged planks with waterproof flooring from Focal Point Flooring America. Redecorate your home with functional and appealing floor coverings that can withstand the moisture you expect in every room. When you begin the process of redecorating your home, you need floor coverings that are both functional and inviting. 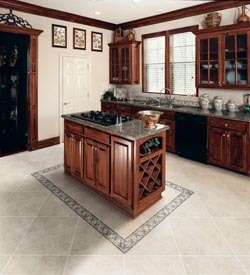 Our vinyl tile is an excellent choice for anyone remodeling kitchens and bathrooms. Depending on the conditions you experience in each room, a waterproof product could be the right way to go. As your business recovers from a weather event, your flooring should be the least of your worries. Commercial clients in need of a new look for their establishment should consider the value that comes with our suite of waterproof products. The added endurance and lasting beauty give your business a professional look that customers will notice. Start a discussion with our design team about flooring options from leading names like Downs H2O. Function and appeal go hand in hand with our broad selection of waterproof luxury vinyl planks. Rooms that experience higher levels of moisture are ill-suited for natural hardwood. Luxury vinyl can withstand the scratches and spills that come with having kids and pets, but standing water is still a problem. In the aftermath of a flood, your waterproof tiles can be dried and reinstalled when the waters recede. Water-resistant vinyl flooring offers a nearly unbeatable combination of performance and visual appeal. Floors with water resistance are important for families with young children and active pets. Spills are bound to happen at any time, so protect your floors with water-resistant carpet. When you need a modern look for an existing establishment, vinyl provides you with durability and charm at a price point that fits your plan. The performance you get with your floors is dependent on proper water-resistant flooring installation. Each contractor we employ has the experience needed to seal your floors the right way. When a flood rolls in, your waterproof tiles and planks can be recovered and reinstalled after your subfloor has been dried. Establish a foundation for modern family living with water-resistant floor coverings. Contact us today for insightful design planning and waterproof floors from some of the leading manufacturers in the industry. We proudly serve customers in Otsego, Minneapolis, Maple Grove, Brooklyn, and Buffalo, Minnesota, and surrounding communities.